Inder Loves Folk Art: Impractical sewing is the best. 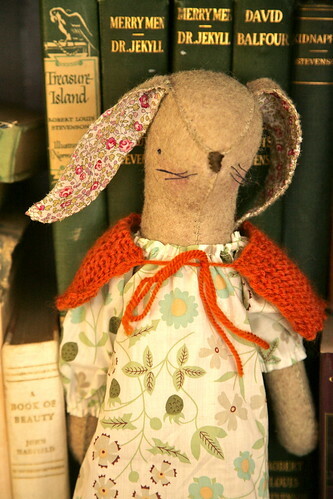 Sometimes, you just need to toss your long and practical "to-sew" list and stitch a bunny. 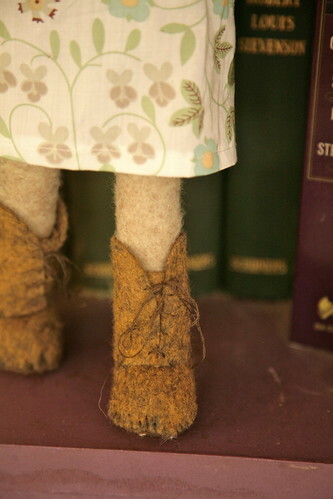 My favorite part - everyone's favorite part - is her little lace-up boots. 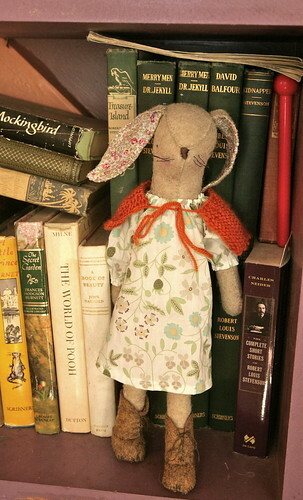 Although I intended (in a vague way) to make this bunny for my Maggie, Joe has really taken to her and has been carrying her around, showing everyone her boots, her shawl, her whiskers, and how she has "a body!" under her dress, demonstrated by hiking her skirt up and exposing her bottom. (Poor Maggie might need some bloomers, for decency's sake!) This is extra sweet because Joe has never been one for stuffed animals or dolls. He calls her "Bunny Rabbit." Of course. He took her to bed with him last night! I did a bit of impractical sewing myself...bunnies too :) The kids haven't seen them yet...I hope they love them, b/c I do! OMG, I love your bunnies, Jane!! They are perfect! Squee! 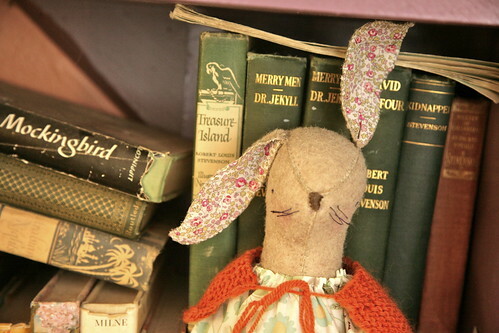 Oh she looks so perfect hanging about with all those books. But I'm sure she looks even more perfect being loved by Joe! She's the sweetest! Beautifully made! That little boot is to die for! !